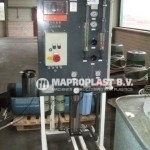 Maproplast BV has several Used Water Preparation Systems for sale. Interested in one of our machines? Ask for an offer! Since 1978 Maproplast buys and sells plastics machinery. We started with mainly injection molders. Now we supply plastics machines covering the whole range of disciplines producing in the plastics industry. On average Maproplast has 800 machines in stock. We travel across the globe to purchase them. Yearly we buy around 500 which are all transported to our warehouse.